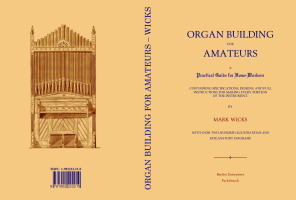 Description: This book contains details of how to make the various parts of a pipe organ, including, the key and stop action, key-boards, pipes, bellows and the case. It also contains information on defects and their cures, and on tuning. Wicks, Mark. Civil service clerk. b. Southwark, London, England, 1852; d. Croydon, 1935. I. Tools and appliances-specifications new method of making pipes. III. Pipes of metal-casting bench and casting box - metal for pipes - melting metal - necessary tools - scale for cutting metal for pipes-formation of sheet metal into pipes. V.	Sound-board, wind-chest, pallets, etc. VII. The building frame and manual action. IX. The stop action and couplers. X. The pedal organ : sound-board, and pedal key-board. XI. Pedal action : coupler great to pedals. XII. The swell, etc.-venetian swell-gridiron swell-box swell-tremlant. XIII. Voicing and toning - defects and their remedies. XVI. Defects generally-list of stops and their combinations-additional specifications.